YouTube is the world’s second largest search engine and 1.3 billion users. Some 300 hours of video are uploaded every minute and 5 billion YouTube videos are watched daily by 30 million daily users. You can rank on Google and YouTube with your YouTube videos showing on the first page and get organic traffic which you don’t have to pay for. Google search will often times show videos in the search results page depending on the search terms used. For some search results the query may return only organic YouTube video results. You can start your research by typing keywords from your niche to see what kind of results Google will return. Video advertising is very powerful since it is most liked format and images convey messages much faster than text. Video can engage the user better and quicker and keep his/hers attention longer. 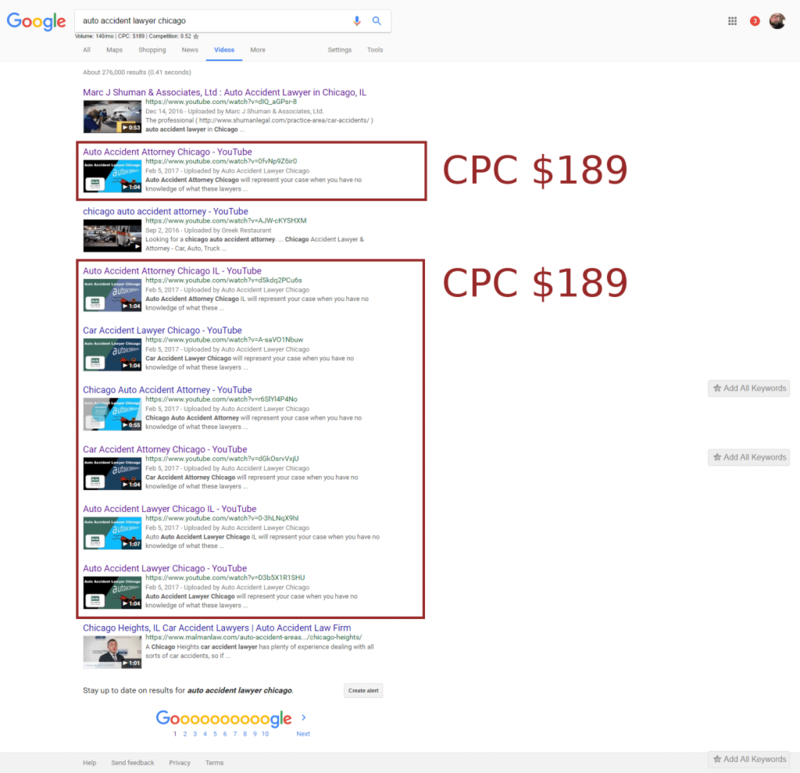 In one of our tests last year we ran we were able to have 8 of our videos on Google page #1 for months for a very expensive keyword you would need to pay a little less than $200 per click in AdWords (see image above). Product and service demos are very often answering most of the questions in costumers mind getting them closer to make a buying decision. Let us help you in your advertising effort because we know how and what needs to be done so your YouTube advertising budget will bring new customers to your business. Click here to schedule a free consultation call. Visit our Facebook Advertising and Google AdWords Advertising pages.